The beautiful statement coffee tables are exceptional examples of craftsmanship in keeping with the tradition of Indian design. 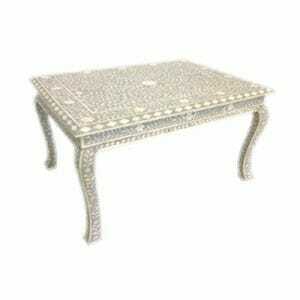 Iris furnishings currently offer some coffee tables in an array of muted tones inlaid with polished bone or covered in glimmering white metal. Our handcrafted coffee tables are an example of flawless design, fusing traditional methods of Indian craftsmanship with a nod to the modern home with a distinct yearning for style and luxury. Our selection of coffee tables is finished with exquisite camel-bone inlays, while the simple design provides a gorgeous surface to use occasionally or every day, immediate use. 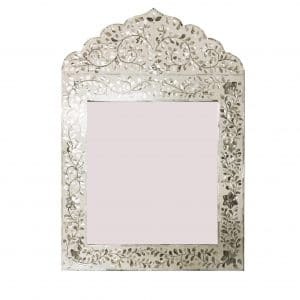 The 100% cruelty-free camel bone is skilfully carved and polished into the solid wood in mosaic-like and naturalist themed patterns found in authentic Rangoli designs, while the white metal range of furniture made by Iris is always a stunning addition to any room needing an injection of opulence and rich textural effect. Where Can I Find Superior Quality Wooden Coffee Tables? 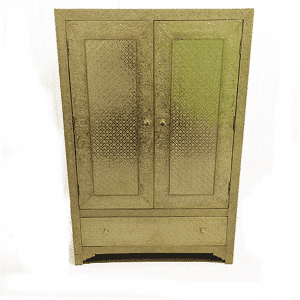 We offer a vast online collection of superbly crafted Indian hardwood furniture including beautiful inlay or embossed metal coffee tables. To have a first hand feel of our stunning inlay coffee table, you can make an appointment with us for a viewing in our Brighton showroom. We recommend a visit to one of the most vibrant, beauty filled cities in the UK and we are nestled amongst the finest eateries and boutiques in Brighton’s North Laine - a tourist delight all year around. 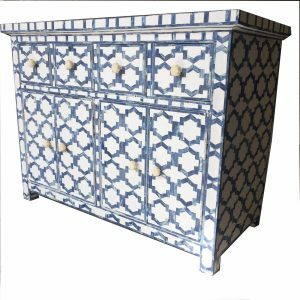 All of our furniture can be made to order at no extra cost and we deliver anywhere in the UK, as well as Internationally. If you live in Sussex, we’ll deliver to you for free. 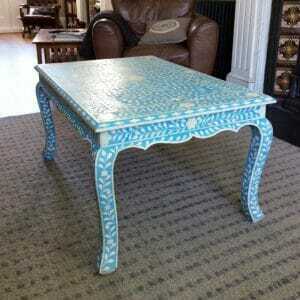 Who Makes Artisan Coffee Tables? 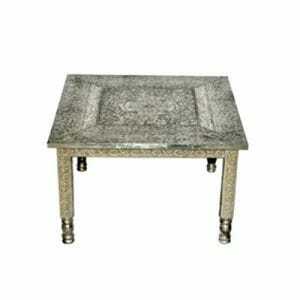 Our hand crafted artisan coffee tables are expertly made in the workshops of the master craftsmen of Rajasthan, who ply their skills in ever inventive ways to renew and revitalise the traditions of their ancestors for a contemporary feel to the ancient Indian art of inlay, metal embossing and pattern painting on decorative furniture. Not simply ornamental, Indian decorated furniture is designed to be used and used well, for many, many years. 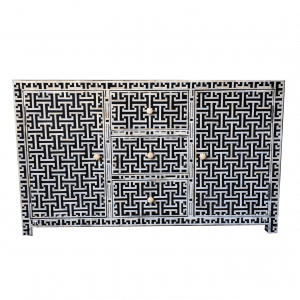 Made from hardy sheesham or mango wood, our artisan coffee tables are adorned with the decorative art of detailed metal emboss-work or fine Indian mother of pearl inlay, also known as nacre, or ethically harvested camel bone. This care and meticulous attention to beauty is symptomatic of Indian art and a visual culture that introduces stunning decorative aesthetics to every possible surface in any given environment. In Rajasthan, where these coffee tables originate, the different regions have all developed distinctive handicraft styles and methods that were and still are in many cases, Royally endorsed and which survive in integrity even today. These differentiated styles retain their original roots while reinventing their art in a constant process of creation that results in our collection of fine Indian furniture constantly receiving new designs alongside our more traditional models. The skilled workers who make these coffee tables and other examples of decorative Indian furniture learn from their forefathers and are trained in academies to become the fine master craftsmen manufacturing the superior quality artisan Indian coffee tables we offer. 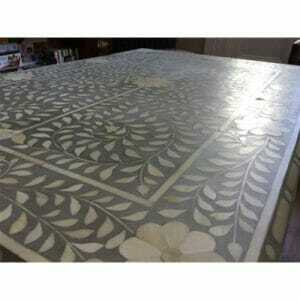 Can I Have My Artisan Indian Coffee Table Made Bespoke? Every home is as unique as the individual and should express your loves, your passions and your preferences as perfectly as you require it to. 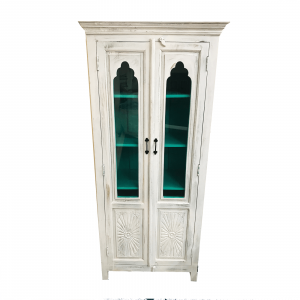 For this reason we stock a huge range of styles, both of furniture models and decorative finishes and colours. And not only do we have a great deal of choice in our collection online, we are always more than happy to help you have your bespoke coffee table made to your exact specifications. 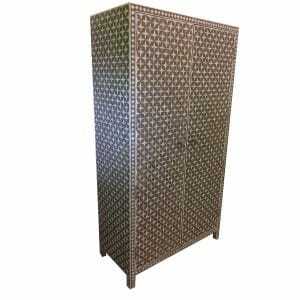 There’s no cost for our luxury bespoke furniture making service. Every item is lovingly hand crafted for you in Indian by dedicated artisans who are truly passionate about their work. If you like the coffee table you see in our collection, but would like its measurements adjusted, would prefer it in a different colour, or with a different pattern, perhaps you would prefer straight legs, rather than curved - all of this and more can be done. 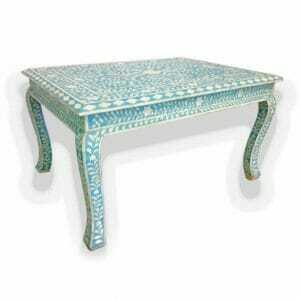 In fact, any decorative style you see anywhere in our catalogue, can be hand made as a coffee table for you, be it painted, embossed or inlaid Indian furniture. If you are looking for the fine quality of Indian wood furniture without the intense ornamentation, you can order a coffee table with a distressed wood finish. 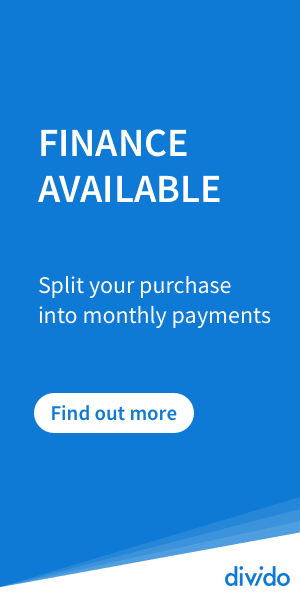 However, if you prefer to keep things simple, then have a look at our collection and choose the piece you really love. We’ll have it delivered to your door when it suits you. Are Indian Coffee Tables Well Made? The wood that supplies the thick, heavily set frame for our solid Indian coffee tables comes from mango or sheesham trees, renowned for its sturdy strength and ability to hold its shape beautifully inspite of temperature or humidity fluctuations, making it the ideal wood to adorn with layers of inlay or embosswork. 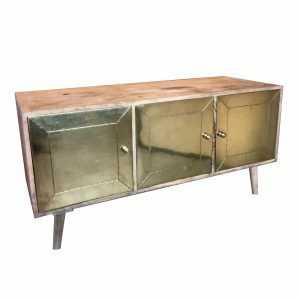 It lasts and lasts and furniture made with sheesham or mango wood is known for its longevity, tending to be an investment in the future rather than something bought as part of a fashion whim. That said, Indian wood coffee tables are stylistically incredibly versatile and have an ability to blend in with everything from minimalist neutral décor to the more sumptuous, ornate looks and so fashion trends in home decoration may come and go, but the timeless look of an Indian coffee table will endure all the changes and continue to be the centre piece which brings the rest of the room together. The skills that shape the wood as well as the ornate inlay pieces hand carved with simple tools, have their roots in the art of furniture-making for royal clients and this prestigious accolade defines the high level of quality that is an integral principle in Indian furniture making. These coffee tables are made to meet the most critical standards and retaining its ancient design principles through improvements that come with modernisation, Indian hardwood furniture is reliably of excellent quality as well as ornately beautiful. 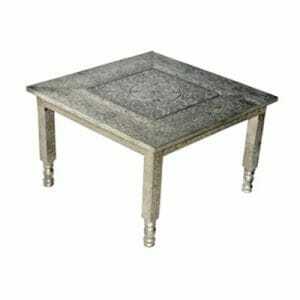 Where Can I Find Ethical, Eco, Fair Trade Indian Coffee Tables? The wood that makes our artisan coffee tables is farmed for sheesham and mangowood furniture making in India and is not only sold in accordance with strict trade laws that protect India’s reforestation projects, the trees are replanted and regrow rapidly. Likewise the treatment of animals in India goes beyond something implemented by law and becomes a culturally endorsed principle, where kindness to animals is encouraged in all walks of life - as a way of life. The life of a camel cannot be taken for trade purposes and we ourselves make our way to India on a very regular basis to familiarise ourselves with every part of the furniture manufacturing process. We know first hand that our materials are ethically and sustainably sourced. The trade agreements we make are aligned with our commitment to honour the culture we love, ensuring everyone is well remunerated for their work and that our activities result in the local businesses prospering. From tree to table, the materials that are used to create beautiful Indian coffee tables are ethically, sustainably and responsibly harvested.